If you had been shopping for lakefront homes in Tallahassee in 2008, you would have needed to pay 28% more to live on the water than you would have off the water. 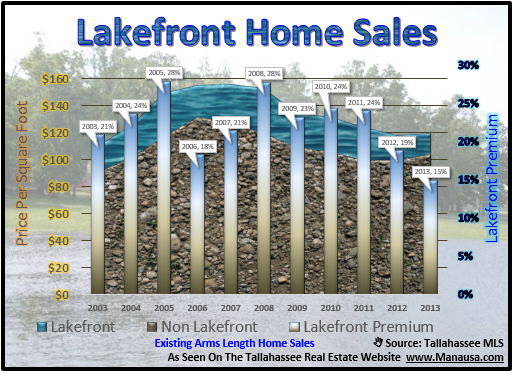 Lakefront property has always sold for a premium over the rest of the homes for sale in the Tallahassee real estate market, but that premium is a moving target that should be analyzed by the prudent buyer. So if you have been thinking that you might like to live on the water, take a look at how that premium has dropped over the past five years. When we look at the real estate graph below, we see the average value of homes in Tallahassee plotted over time. Specifically, we are looking at arms-length (no distressed home sales) residential properties that are being re-sold (no new construction). The brown dirt area measures the average value for a non lake house (measured on the left vertical axis) while the blue water area shows the average value for a lake house (also measured on the left vertical axis). The vertical bars show the corresponding lakefront premium for each year. At 15%, 2013 is offering up the best deals for lake houses for sale in Tallahassee. The following map shows the lake houses that are on the market today. If you want more information on a particular home, simply click on the marker on the map and it will open up the listing to show you up to 25 pictures of each home. Needless to say, these are some of the best backyard views in Tallahassee. You can also zero in on the perfect property by adjusting the settings at the top of the map display. You can make changes in the price range, the number of bedrooms, bathrooms, and size of the homes to be displayed. Buying a waterfront home is like buying any other niche specialty home. You ought to work with a real estate buyer's agent who understands the specific market for these special homes. This knowledge of the market can be worth tens of thousands of dollars to you during negotiations before and after you go to contract, so make sure to choose your agent wisely. If you would like to know how we can help you explore the best lakefront homes in Tallahassee, just drop me a note and we will respond to you in a rapid and professional manner.